Zanskar is a subdistrict or tahsil of the Kargil district, which lies in the eastern half of the Indian state of Jammu and Kashmir. Situated in an area hotly contested by Pakistan and India, leading to two wars and the danger of a nuclear confrontation in the 1990s, the region has great political significance. Padum, a town of 700 people, serves as the administrative center for the region. Zanskar, together with the neighboring region of Ladakh, formerly belonged to Guge or Western Tibet. The people of Zanskar have subsisted, until recently, in nearly total isolation throughout their history. With 14,000 people living in villages scattered through a 2,700 square mile area, depending upon the yak and mountain farming for subsistence, the people of Zanskar have lived a simple, spiritual existence. Having existed as an independent Buddhist kingdom in the fifteenth century, then existing as part of Western Tibet, many of the men practice Tibetan Buddhism in the monasteries of Karsha and Phugtal while the women spend extended lengths of time herding yak in the Himalayas. A road opened the region to tourism in the 1980s, leading to challenges that threaten their simple, spiritual existence. 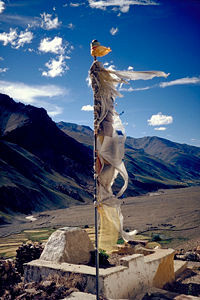 Prayer flag above the monastery (Gompa) of Tanze, in the Kurgiakh valley. Zanskar covers an area of some 7,000 square kilometers (2,700 square miles), at a height of between 3,500 and 7,000 meters (11,500–23,000 feet). It consists of the country lying along the two main branches of the Zanskar river. The first, the Doda, has its source near the Pensi-la (4,400 meters) (14,450 feet) mountain-pass, and then flows south-eastwards along the main valley leading towards Padum, the capital of Zanskar. Two main tributaries known as Kargyag river, with its source near the Shingo-La, and Tsarap river, with its source near the Baralacha-La forms the second branch. Those two rivers unite below the village of Purne to form the Lungnak river (also known as the Lingti or Tsarap). The Lungnak river then flows north-westwards along a narrow gorge towards Zanskar's central valley (known locally as gzhung khor), where it unites with the Doda river to form the Zanskar river. The Zanskar river then takes a north-eastern course until it joins the Indus in Ladakh. High mountain ridges lie on both sides of the Doda and Lingti–kargyag valleys, which run north-west to south-east. To the south-west standsthe Great Himalayan Range which separates Zanskar from the Kisthwar and Chamba basins. To the north-east lies the Zanskar Range, which separates Zanskar from Ladakh. The Zanskar river, which cuts a deep and narrow gorge through the Zanskar range, constitutes the only outlet for the whole Zanskar hydrographic system. Those topographical features explain the difficult access to Zanskar from all sides. Neighboring Himalayan areas maintain communication across mountain passes or along the Zanskar river when frozen. The easiest approach leads from Kargil through the Suru valley and over the Pensi La. In 1979 the first and only road in Zanskar had been built to connect Padum with the main road from Srinagar into Ladakh along that track. Alexander Csoma de Koros had been one of the first Tibetologists to spend an extended period in the region, spending over a year living in the region in 1823. After being integrated into the newly formed state of India in 1947, Zanskar and the neighboring region of Ladakh had been declared restricted areas and only opened to foreigners in 1974. 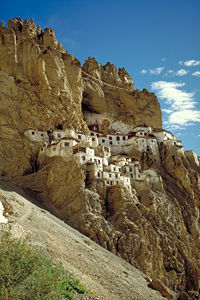 The Monastery of Phugtal in south-east Zanskar. Much of Zanskar's vegetation grows in the lower reaches of the valleys, and consists of alpine and tundra species. The meadows covered with thousands of edelweiss make for an impressive scene. Farmers grow crops including barley, lentils, and potatoes at the lower elevations, as well as apricot trees. Domesticated animals such as the yak, dzo, sheep, horse, and dog inhabit the region. The marmot, bear, wolf, snow leopard, kiang, bharal, alpine Ibex, wild sheep and goats, and the lammergeier number among the wildlife found in Zanskar. Zanskar constitutes a high altitude semi-desert lying on the Northern flank of the Great Himalayan Range. That mountain range acts as a climatic barrier protecting Ladakh and Zanskar from most of the monsoon, resulting in a pleasantly warm and dry climate in the summer. Little rain and snowfall fall during that period, although recent decades have shown a trend towards increasing precipitation. Several water-driven mills had been built during ancient periods of drought at a great distance from the villages, but have been abandoned because running water has become available nearer to the settlements. Zanskari houses, though otherwise well built, adapted poorly to the recently increasing rainfall, as their roofs leak, catching their surprised inhabitants unprepared. Most of the precipitation occurs as snowfall during the harsh and extremely long winter period. Those winter snowfalls, of vital importance, feed the glaciers which melt in the summer and provide most of the irrigation water. Row of Chorten (or Stupa) at the village of Purne. Zanskar has a small population; the April 2006 medical census records a population of 13,849 people. The medical census embodies the most accurate indicator of population as it collects birth, death, and census information from Zangskar's twenty two medical aid centers. Roughly 95 percent of the inhabitants practice Tibetan Buddhism, while the remainder declare themselves Sunni Muslims, whose ancestors settled in Padum and its environs in the nineteenth century. The majority of Zanskaris have mixed Tibetan and Indo-European origins; notably Dard and Mon. The latter, ethnically Dard, use "Mon" to distinguish themselves from later Dard settlers. The population lives mainly in scattered small villages, the largest being the capital Padum, with nearly 700 inhabitants. Most of the villages sit in the valleys of the Zanskar river and its two main tributaries. Given the isolation of that region, the inhabitants tend towards self-sufficiency, and until recently lived in almost complete autarky. External trade has always been necessary for the acquisition of goods such as tools, jewelery, or religious artifacts. The Zanskari mainly cattle-rear and farm their own land. Cultivable land, scarce, confines farming to alluvial fans and terraces; cultivated fields rarely exist above an altitude of 4,000 meters. The Zanskaris have developed a system of intensive arable agriculture and complex irrigation to produce enough food in those conditions. The scarcity of cultivable land has also resulted in a tendency towards a stable, zero-growth population. An efficient birth-control system in Zanskar has historically been achieved by the common practice of polyandrous marriage, in which several brothers married the same wife, and the widespread adoption of a celibate religious life. A high (natural) infant mortality rate also contributes to the maintenance of population stability. Livestock, especially the yak, play a vital role in the life of Zanskar. Yaks plough the land, thresh the grain, and carry heavy loads (up to 200 kilograms). Their dung serves as fertilizer and the only heating fuel available in the region. They constitute a vital source of milk and sometimes, but rarely, of meat. The Zanskari use the yak's fur to make clothes, carpets, ropes, and bed covers. The first traces of human activity in Zanskar trace back to the Bronze Age. Petroglyphs attributed to that period suggest that their ancestors lived as hunters on the steppes of central Asia between Kazakhstan and China. An Indo-European population, known as the Mon, might then have lived in that region before mixing with or being replaced by the next settlers, the Dards. Early Buddhism coming from Kashmir spread its influence in Zanskar, possibly as early as 200 B.C.E. The earliest monuments date from the Kushan period. After that eastward propagation of Buddhism, the Tibetans, who imposed their then animistic Bön religion, overran Zanskar and a large part of the Western Himalaya in the seventh century. 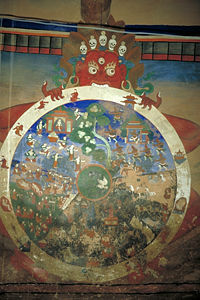 Fresco on a wall of the Bardan Gompa representing a Wheel of Life. Buddhism regained its influence over Zanskar in the eighth century when Tibetans converted to that religion. Between the tenth and eleventh centuries, two Royal Houses were founded in Zanskar, as well as the monasteries of Karsha and Phugtal. Until the fifteenth century Zanskar existed as a more or less independent Buddhist Kingdom ruled by between two and four related royal families. Since the fifteenth century, Zanskar has been subordinate to Ladakh, sharing its fortunes and misfortunes. In 1822 a coalition of Kulu, Lahoul, and Kinnaur invaded Zanskar, plundering the country and destroying the Royal palace at Padum. In the mid-twentieth century, border conflicts between India, Pakistan, and China prompted the closing of Ladakh and Zanskar to foreigners. During those wars Ladakh lost two-thirds of its original territory, losing Baltistan to Pakistan and the Aksai Chin to China. Ladakh and Zanskar, despite a tumultuous history of internal wars and external aggressions, have kept their cultural and religious heritage since the eighth century. Thanks to its membership to the Indian Union, the region stands out as one of the few in the Himalayas where traditional Tibetan culture, society, and buildings survived the Chinese Cultural Revolution. In the last twenty years, the opening of a road and the massive influx of tourists and researchers have brought many changes to the traditional social organization of Zanskar. In 2007 the valley suffered its third year of a desert locust infestation with many villages losing their crops. In response, the monasteries carried out Puja (prayer) to get rid of them while the government planned the use of insecticides, which the Buddhists resisted but, in some cases, tried the solution with undocumented success. Zanskar appears as “Zangskar” mostly in academic studies in social sciences (anthropology, gender studies). Older geographical accounts and maps may use the alternate spelling "Zaskar." An etymological study (Snellgrove and Skorupsky, 1980) of the name reveals that its origin might refer to the natural occurrence of copper in this region, the Tibetan word “Zangs.” The second syllable seems more challenging as it has various meanings: “Zangs-dkar” (white copper), “Zangs-mkhar” (copper palace), or “Zangs-sKar” (copper star). Crook (1994) partly shares that interpretation but suggests that the origin of that name might also be “Zan-mKhar” (food palace), because the staple food crops grew abundantly in an otherwise rather arid region. Some of the religious scholars of the district, also cited by Snellgrove and Skorupsky (1980) and Crook (1994), held that originally “bZang-dKar,” meant good (or beautiful) and white. “Good” would refer to the triangular shape of the Padum plain, the triangle being the symbol of Dharma and religion; “white” would refer to the simplicity, goodness, and religious inclinations of the Zanskaris. Thus, even if etymologically correct to use “Zangskar,” “Zanskar” constitutes the most frequently found spelling for this region. Tourism has been a major disruption for Zanskar in recent times. The opening of the region to international visitors has brought benefits such as the financing of schools and the restoration of monasteries and roads, but has also taken its toll on this fragile mountain environment and its population. Not only do the campsites along the trekking routes look more and more like junkyards at the end of the tourist season, but the local population has sometimes developed a questionable attitude towards visitors, involving begging, and very occasionally stealing. Village houses in the Kargyak Valley. Zanskari women and children tend herds. Crook, John, and Henry Osmaston. 1994. Himalayan Buddhist Villages: Environment, Resources, Society and Religious Life in Zangskar, Ladakh. Bristol, University of Bristol UK. Dèzes, P. 1999. 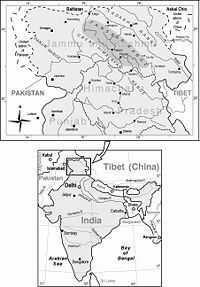 Tectonic and metamorphic Evolution of the Central Himalayan Domain in Southeast Zanskar (Kashmir, India). Mémoires de Géologie (Lausanne) No. 32. Gutschow, Kim. 2004. Being a Buddhist Nun: The Struggle for Enlightenment in the Indian Himalayas. Harvard University Press. Snellgrove D.L. and T. Skorupsky. 1980. The Cultural Heritage of Ladakh. Warminster, Aris and Phillips. This page was last modified on 5 July 2013, at 16:08.